This year’s last sunrise was on 26 October, 13 days ago, at 12:07 hours. 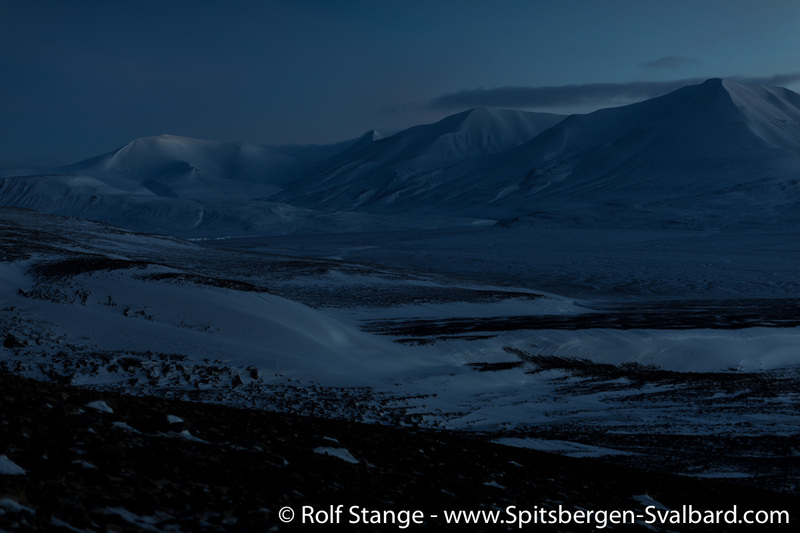 The sun went down again at 13:14 hours and it won’t be visible again until late February. 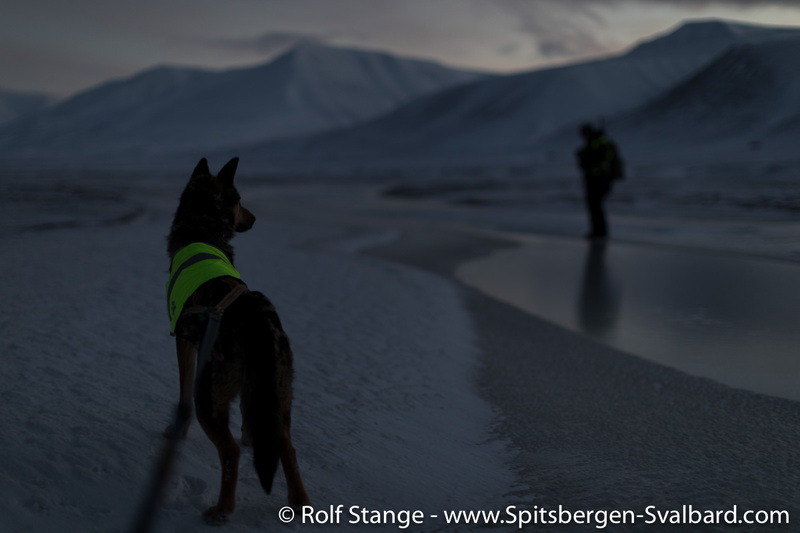 Polar night in Spitsbergen: hiking with dogs in Adventdalen near Longyearbyen. Today, 08 November, the sun does not climb higher than near 5 degrees below the horizon. That ist at least good enough for several hours of civil twilight, perfectly fine for orientation out in the field in clear weather conditions. This is the time of the „blue light“, as it is called here, blålyset in Norwegian. Being out there is great fun. It is so different now from what it was like just a few monhts ago! Of course the tours are shorter now and less remote. Adventdalen and not Edgeøya. And dogs are great tour companions! Photography is also quite different. It is much slower. You don’t just grab the camera, zoom in and press the button. The flexible zoom lenses stay at home now. Instead, I carry two prime lenses, 20 mm and 50 mm, that’s all I am currently using (more info about camera equipment here). And the tripod, that is really important and frequently in use. Free-hand photos without artificial light is hardly possible anymore, maybe around noon with high ISO-values. High-end cameras with full-frame sensors really show their muscles now. 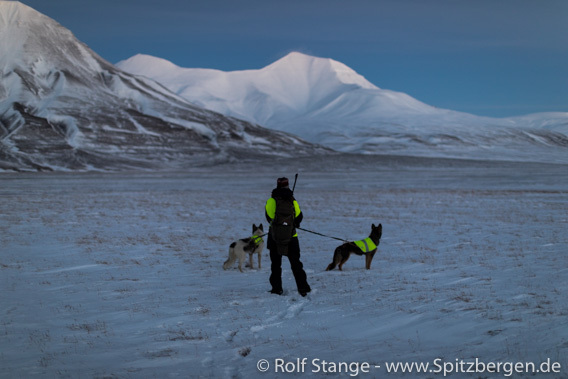 And high-visibility jackets and headlamp are must-haves at this time! Oh yes, warm clothing does not hurt either. 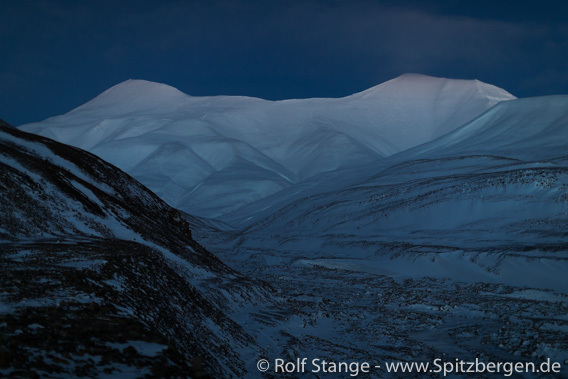 Most polar night photos are brighter than reality, today’s cameras and lenses catch so much light. The images on this site are no exception. To illustrate the difference, have a look at these samples to compare. I would say that the darker image shows the real light conditions. 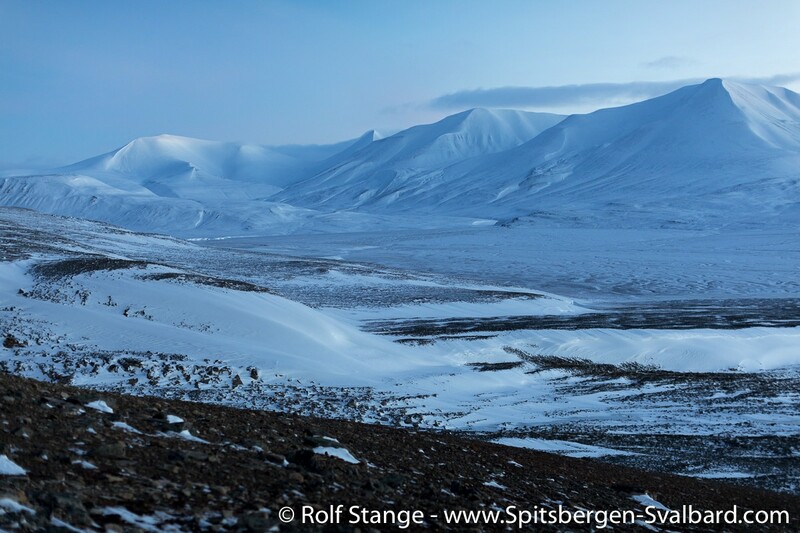 A few kilometers across Adventdalen take us to Operafjellet. In summertime, this would have involved a rather hefty river crossing, now we just have to take care of black ice. Monument for the airplane crash at Operafjellet in 1996. 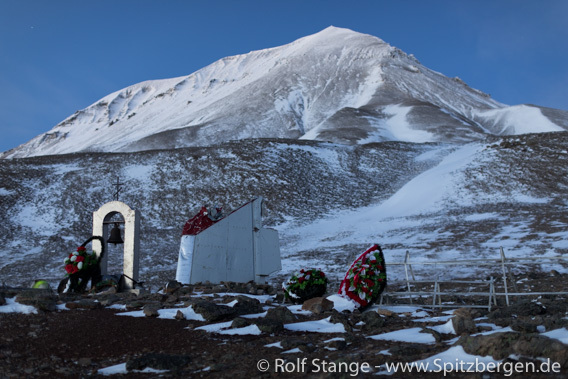 On 29 August 1996, a Russian aircraft with 141 people on board crashed into Operafjellet. Miners, employees and family member on the way to Barentsburg. There were no survivors. 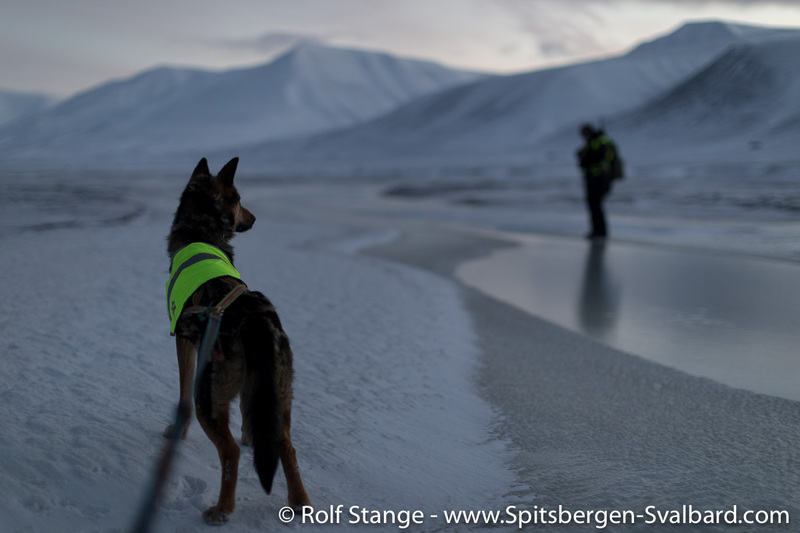 It was the biggest catastrophe ever in Spitsbergen in times of peace. There is this little monument at Operafjellet for the victims.